Betting shops need to perform complex calculations in order to determine and pay out the winnings of complicated bets on horse or greyhound races. This is known as "settling the bet". A few special models of calculator were produced to make these calculations easier, apparently all in Britain. The Sporting Life was a British weekly sports newspaper published until 1998 by the Mirror Group Newspapers Limited. A Settler is the person behind the counter in a betting shop who deals with the customers. The main display is an 8-digits amber gas-discharge 'Pandicon' tube—effectively 8 'Nixie'-type assemblies within a single tube. There is an additional window with a 7-segment display. 4 function and betting functions. Uses 7 large integrated circuits (all with markings removed) and 24 small ones. The operating manual is dated January 1972. 262 x 360 x 109 mm / 10.3 x 14.2 x 4.3". Manufactured by Specialised Electronic Calculators Limited, Unit 9, Block 1, Faraday Place (Works), Thetford, Norfolk, England. Close up of the keyboard with the simplified operating instructions. 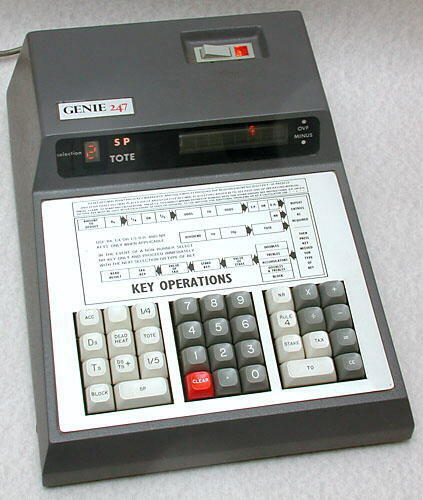 The GENIE 247 with the cover removed. Close up of the cicuit board. 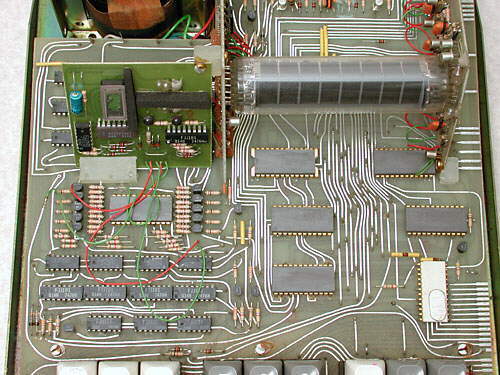 Note that all of the larger integrated circuits have had all markings removed. The 'Pandicon' display tube provides large, easy to read, numbers. Inside seen from the side to reveal more of the circuitry. Display is 8 digits, green VFD (vacuum-fluorescent display). Main integrated circuits - National Semiconductor DS8881N and MM5799NBX/N. The latest date codes on the integrated circuits are from 1978. 254 x 242 x 109 mm / 10.0 x 9.5 x 4.3". Manufactured by AMBIT International, Department MPD, 200 North Service Road, Brentwood, Essex, England. "Design Copyright Mirror Group Newspapers Limited"
The circuit board in this machine is identical to that in the Sporting Life Settler by Sinclair, below, except that it has a slight extension on one side for mounting it in the casing. 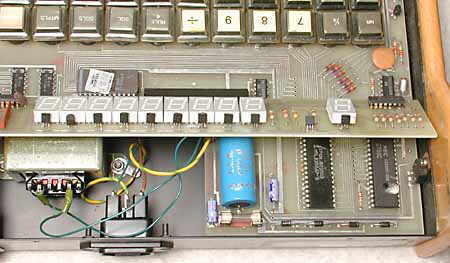 The circuit board of the Super Settler seen, after removing the cover, through the gap between the keyboard and display. It is nearly identical to that of the hand-held Settler below. Display is 8 digits, red LED, with an additional window for a 7-segment display. The circuit is based around a Nippon Electric Company (NEC) D780C which is a fully compatible version of the original NMOS version of the ZILOG Z80 micro-processor. 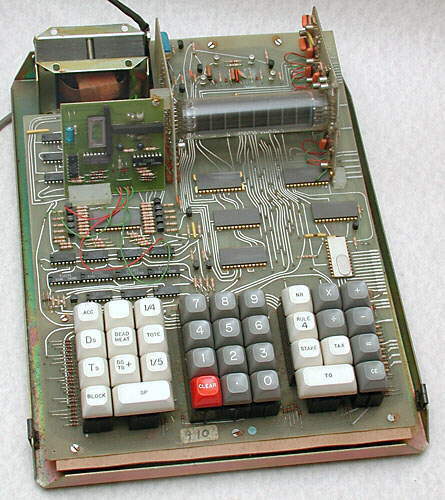 The program to produce the calculator functions is stored in a 2732 EPROM (Erasable, Programmable, Read-Only memory). This stores up to 32 Kbits (= 4 KBytes) of program. The integrated circuits are here date coded to 1982. 267 x 225 x 89 mm / 10.5 x 8.9 x 3.5". Manufactured by Silicon Express, Silicon House, Rothley, Leicestershire, England. 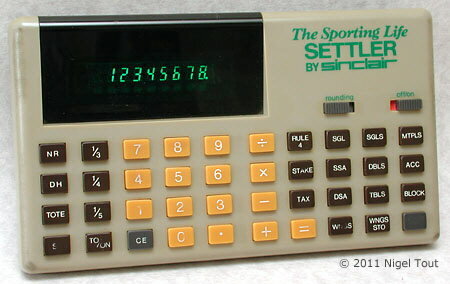 Although dating from as late as about 1982, this calculator is included due to its interesting electronics. 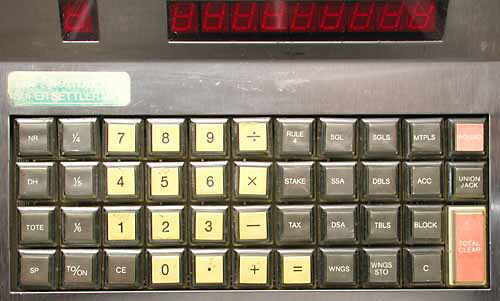 By this time in their development standard desktop electronic calculators were manufactured in tens of thousands, and generally had vacuum fluorescent displays and one main integrated circuit which performed the calculating functions. 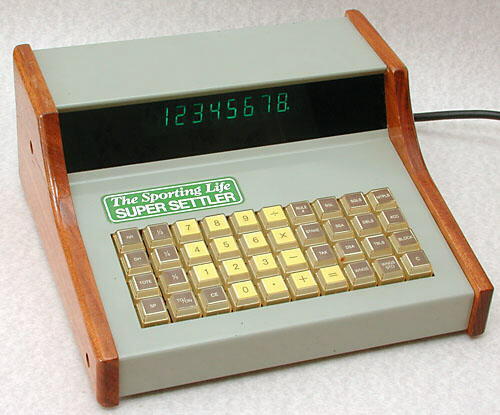 This highly specialised calculator was a bespoke design and has features suggesting that it was manufactured in small quantities. 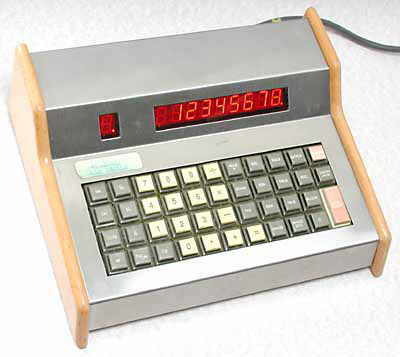 Use of large LED displays in a desktop calculator is very unusual, but by this time large 7-segment LED displays were cheap and very easy to interface to integrated circuits - easier than vacuum fluorescent displays. The specialised calculator functions are obtained using a Z80 type microprocessor with program held in a 2732 EPROM, with 4 KBytes capacity. The case is made of wood and sheet metal, rather than plastics mouldings which are expensive to get into production. 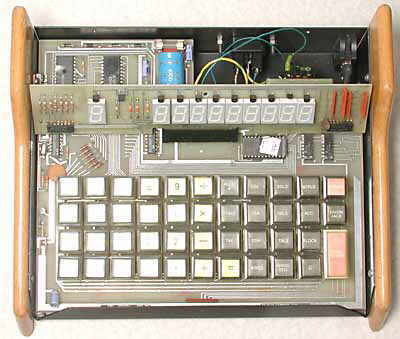 "I designed this calculator for Silicon Express and had access to the original algorithms from Sinclair. I spent many sleepless nights with the programming as it was actually programmed directly in machine code, and I did not have access to any form of assembler software in those days. 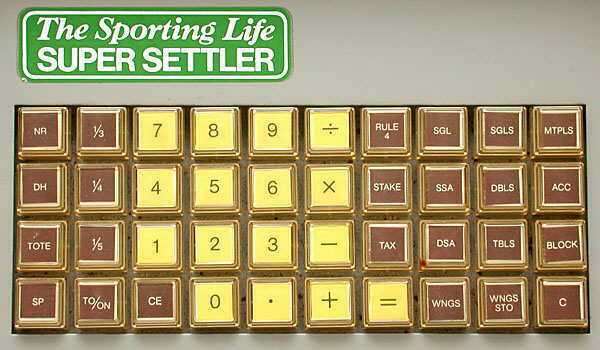 The reason that it was commissioned was that Sinclair could no longer source the chips used in the original Super Settler. I used standard devices that could be sourced anywhere." 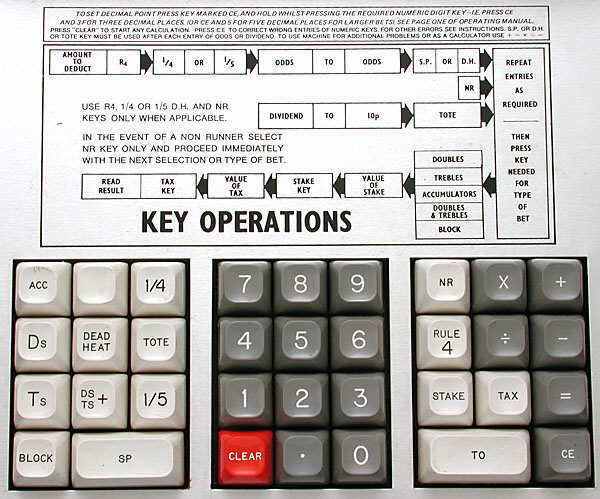 Close up showing the specialised keys for betting functions. With the cover removed showing the circuit boards and the large 7-segment LED displays. Close up showing the integrated circuits. At bottom right are a Mitsubishi M5L8255AP-5 and an NEC D780C. Just above the display, to the left, is the 2732 EPROM which holds the program for the special functions. This is mounted in a socket so that the program can be altered if necessary. All are date-coded here to 1982. 162 x 93 x 29 mm. (6.4 x 3.7 x 1.1 ins). This hand-held calculator has a similar casing to that used on the Sinclair President. 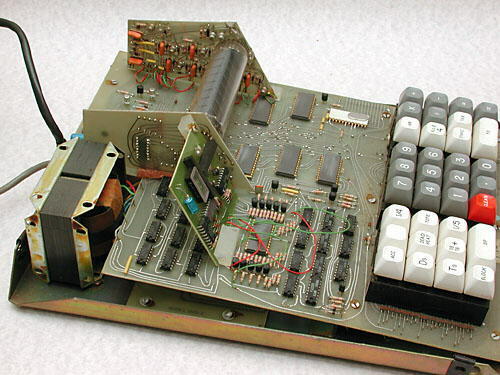 How far Sinclair was involved with the design and manufacture of this calculator is not known. 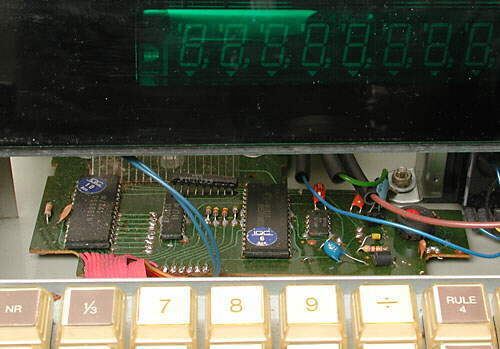 Both circuit boards are marked "Radofin" which was a company based in both London and Hong Kong which also sold calculators under its own name. The circuit board. The large integrated circuits are the DS8881N and MM5799NBX/N. 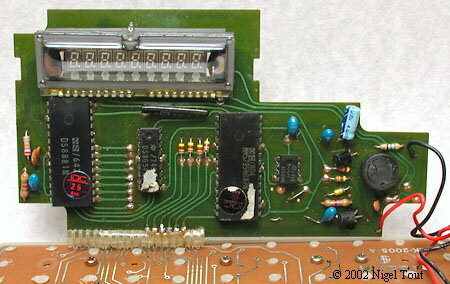 A similar circuit board is used in the Sporting Life Super Settler, above.